Unroll dough; separate into 4 rectangles. Press perforations and seams together to seal. Cut each dough rectangle into 10 lengthwise strips. 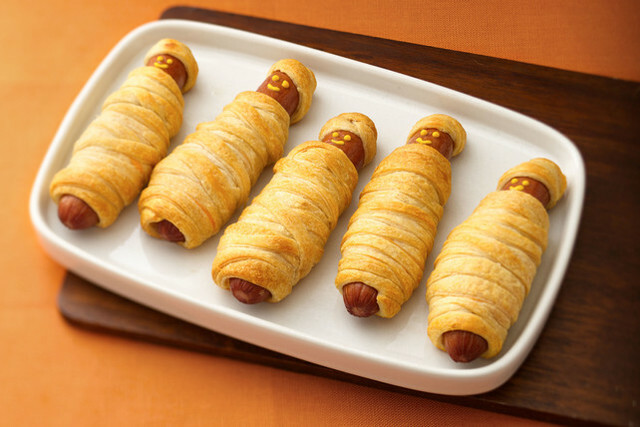 Place 1 Singles strip on each frank, then wrap with 4 dough strips to resemble mummy as shown in photo. Place on baking sheet; spray lightly with cooking spray. Bake 13 to 17 min. or until franks are heated through and dough is golden brown. Add mustard to each for the eyes and mouth. Prep Time 20min. Total Time 37min.